Planning Board co-chairmen Alex Thomas, left, and Greg Horth, and Board member Meg Kennedy reflect on the firefighters’ inputs. 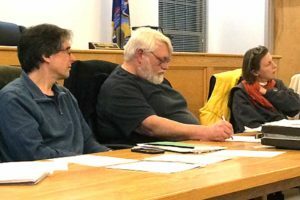 For at least two months now, Hartwick firefighters have been voicing their concerns about the building’s height, and also about having to rely on a ladder truck from either the Cooperstown or Oneonta fire departments if the hotel is built that high and a fire were to break out there. 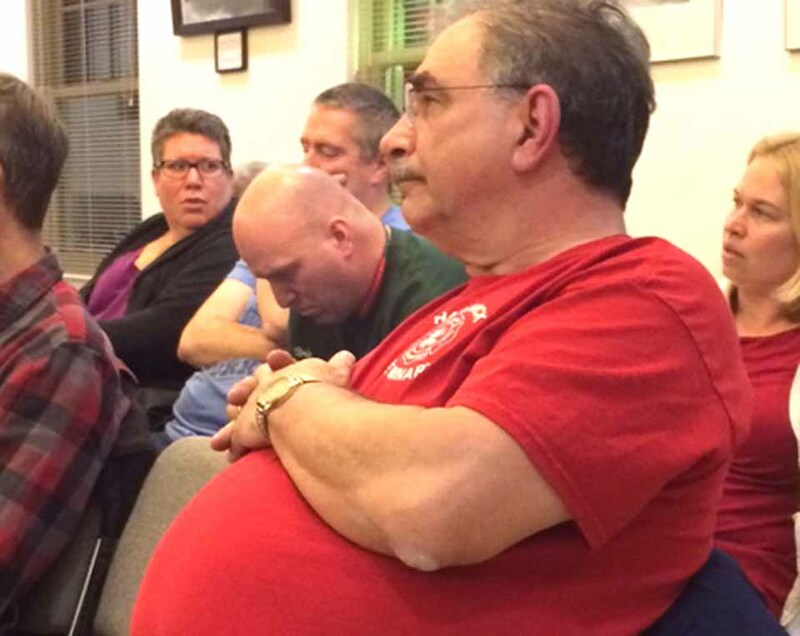 Ed Cox, Hartwick #2’s second assistant fire chief, expanded the critique to include concerns about access and egress from the site, which is on a curve just south of the Dollar General, and across Route 28 from Paraco Gas. Skyline “would be willing to negotiate the purchase of these packs for the hotel,” Benz added. The discussion was tabled for the Board to review SEQR Part 1, for which there were no major issues. Greg Horth, Planning Board co-chairman of the Planning Board, said the board needs some reassurance on the firefighting situation. “We’d like to see something in writing from the Oneonta Fire Department and the Cooperstown Fire Department concerning reaction times for their Ladder Trucks,” he said. The Town of HARTWICK PLANNING BOARD is not equipped to handle this request! Since there are no Land Use Regs in the town they do not have the tools necessary to make demands of developers that will require them to meet the specific safety requirements and other needs that could be required of developers to protect the people they represent! It should not be hard to identify this is the case, all one needs to do is take a drive through the area that has been developed to date! No continuity of street scapes, sidewalks, street lights, no assurance that ground water is being protected, is there a need for water towers and much more that could have been part of the negotiations with developers. Had these regs been in place years ago when it all began with Dreams Park and follow a comprehensive plan and could require developers to offset costs of improvements for health and safety issues! Btw the way it is a known fact the reasons developers make Hartwick their first choice is due to the fact there are no regulations and much less expensive to get in the door! With all due respect. A comprehensive plan would have likely eliminated the dreams park. Continuity of streetlights and sidewalks and burdensome regulations are the last thing we need. I say if you want to be governed like that, live in Queens. The fire department, local boards and the people currently involved, along with residents are more than capable of making these decisions. For the record I’ve seen countless Comprehensive plans that come and go and do nothing but hurt the locality they were intended to serve. Additionally, this process is a negotiation, I’m not sure whether Hartwick needs a ladder truck of their own but if they do, hold your ground and make the developer facilitate that. If you want to have a hotel that is taller than all of the surrounding ones, thus generating more revenue, then the startup costs will be higher. I’m all for successful business, but not at the taxpayers expense. No matter what happens, more government regulations will never be the answer.